Concorde retired this October after nearly 35 years of flight and more that 25 years of passenger service, bringing to an end the era of supersonic passenger transportation. This section details the events over her fianl months, as the aircraft flew their final flights. 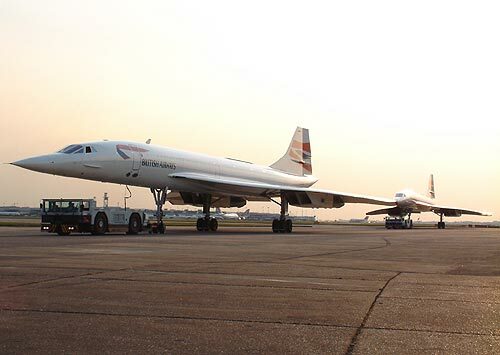 It also features special appearances that the fleet took part in, as well as covering the final chapter of the Concorde tale, as the aircraft were retired to their final homes in museums around the world. Why IS Concorde being retired? Concorde made an tidy operating profit for the airlines, but with the aircraft approaching 30 years of age a large investment programme would be required to update many of the systems on board the aircraft. With the premium first class market as it is post September 11th 2001, there is no hope of the airlines being able to fund this investment and keep the aircraft in profit. Therefore, the airlines decided to write off the current levels of investment in the aircraft, of around �0M, rather than risk having to write off sums that could top �0M in the coming years, if the premium travel market did not improve. British Airways have stated that they intended to "Celebrate Concorde" in its final months, and attempt to give people through the UK a chance to fly on-board the aircraft, before they were retired to museums. It is a sad time, but the inevitable really only came forward a few years. We should celebrate what Concorde was and still is - the only profit making Supersonic Passenger Jet to ever to go into regular revenue service. The Americans or Russians could not even do it - that's how far ahead of its time it was ... and still is!